Welcome to the Church Street Merchants website, a delightful and useful resource for both residents and businesses in the Vienna, VA area tying together their interests in an interactive and fully functional web experience. Whether it's a bakery item, a handmade gift, a restaurant reservation or an special event in the town center you're interested in, you can find out about all these things and much more with just a few clicks. Merchants are able to upload news of upcoming events, make updates to keep customers informed of inventory, special offers and other changes as they serve the community. It is a one-stop shopping location. We are intersted in bringing the very best and the very latest web experience we can offer and we value the input and involvement of all patrons and merchants alike. So don't hesitate to email ideas or suggestions for what you would like to see on the site, we would love to hear from you. 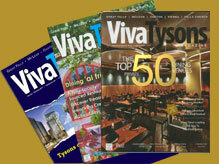 VivaTysons, the area's difinitive magazine for local information and news for Tyson's Corners and surrounding vacinities is now available at over 150 locations in Northern Virginia, online and by subscription. Click here for details.